Canon has expanded its Pixma MX line of printers with four new All-in-Ones. The Pixma MX395, MX455, MX525 and MX925 replace the existing Pixma MX375, MX435, MX515 en MX715/MX895 respectively. With features including printing, copying, scanning, faxing, an ADF and intelligent software, the printers should warrant high productivity. The Pixma MX925 has improved hardware, and two front-loading paper trays for 250 sheets of normal paper and up to 20 sheets of photo paper. Canon claims that the print speeds have improved over the previous model. With the integrated 30-page ADF (Automatic Document Feeder) on the Pixma MX395, MX455 and MX525, scanning and copying multipage documents should be much easier. The MX925 has a 35-page ADF. Each of these printers has a large colour display which directly provides access to cloud services. For all of Canon’s Pixma MX printers, high-capacity XL cartridges are available. 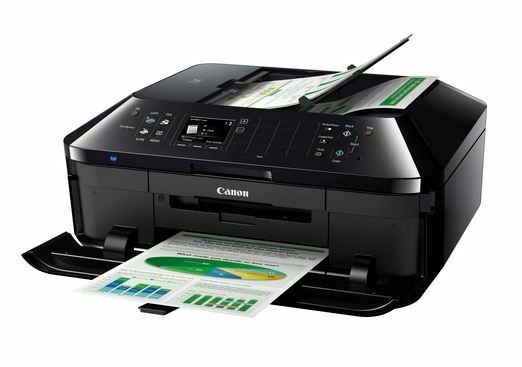 The MX925 is the first Canon printer with an option for an XXL cartridge for black ink. The MX455, MX525 and MX925 offer several connectivity options, including printing from smartphones and tablets through Canon’s Easy-PhotoPrint app for Android, iOS and Windows RT. With the integrated WiFi, the printers can be shared across the network easily. The MX525 and MX925 support Pixma Cloud Link with Google Cloud Print to remotely print Google Docs or Gmail attachments (JPEG or PDF files). The Pixma MX455, MX525 and MX925 have an extra USB port, which allows PDF and JPEG scans and copies of faxes to be stored to an external USB flash drive. Canon’s new Pixma MX printers will be launched in March of 2013.